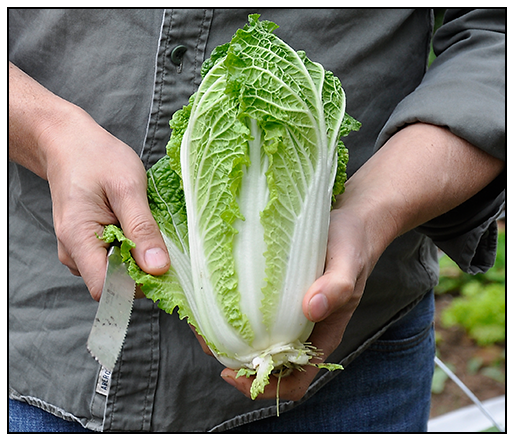 Organic Chinese Cabbage 'Minuet' (F1) is a fast growing mini variety which is best grown as a fall crop in the north. As the storm rages outside, I thought that I might share some of the late crops which we are harvesting before the storm today. 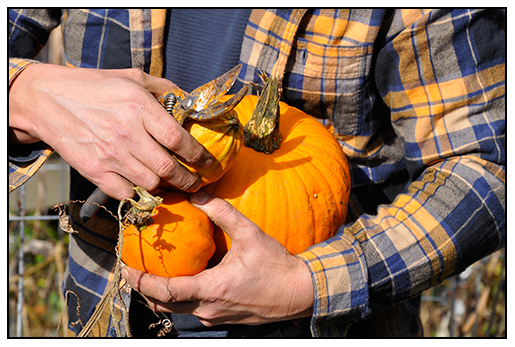 The garden can provide some excellent food crops for home gardeners in the fall. Everyone things about planting seeds in the spring, but more often than not, cool-growing crops grow better in the autumn, since the shortening days and colder weather keeps insects at bay, and reduces the likelyhood of some varieties 'bolting' - going to seed before they are mature due to hot weather. 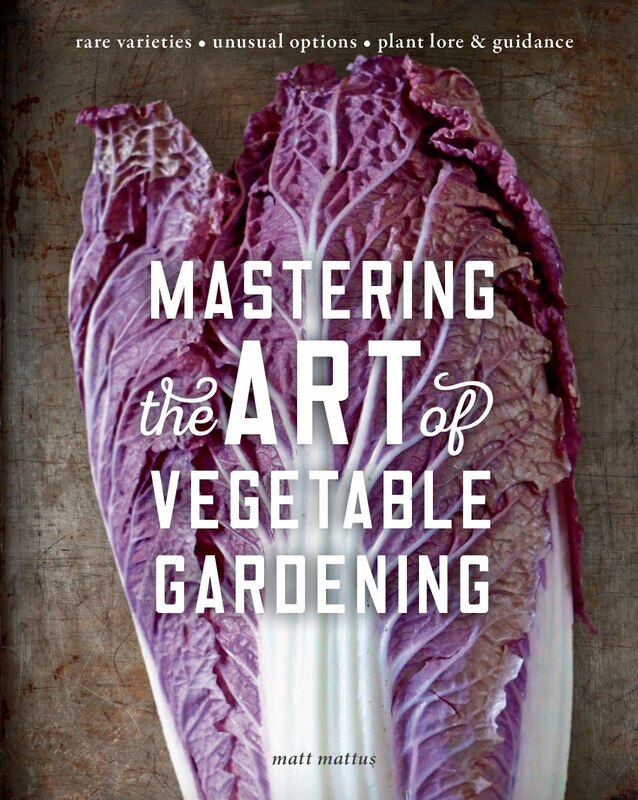 In fact, Chinese Cabbage and rutabaga are often only grown in the fall. Many gardeners call it a day once the tomatoes freeze, but we replant fall crops in our raised beds each August, often while tomatoes are still being picked. Seeds of lettuce, turnips, Chinese or Napa cabbage, spinach, Swiss chard and radishes are sown as soon as soil is made available. These crops can all handle light to heavy frosts, and they mature in less than 50 days, so they are perfect for quick-crops in the fall as the weather begins to cool. 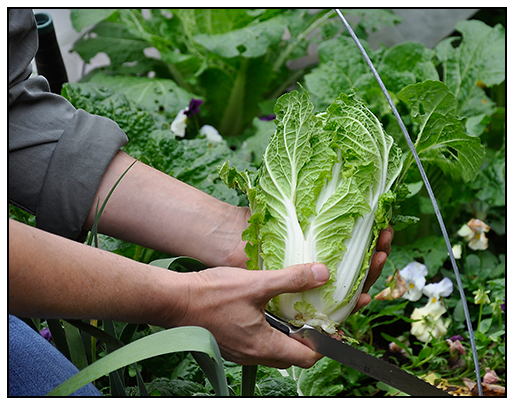 Best of all, many veggies grow best when planted in late summer for fall harvest - take the Chinese Cabbage for example. A spring sowing will often bolt to flower as soon as the weather becomes warm, but when sown in late August, the plants form heads easily in the cool weather. Also, insect damage is less likely to occur, especially when crops are covered with fiber coverings, as I did this year. 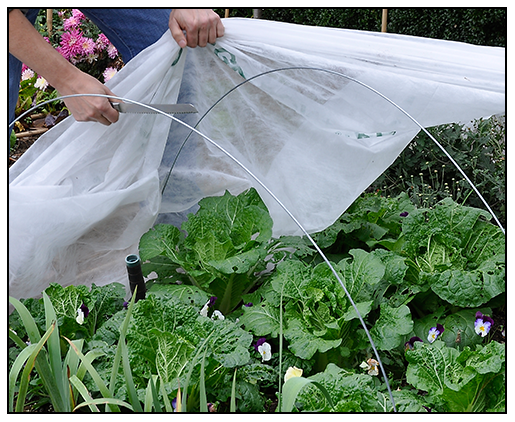 Grown under Remay fabric to discourage pests, the only pest left to bother the Chinese cabbage this year, was slugs. With the outer leaves removed, the inner core shows no damage at all. We soak the heads in salted water for an hour to kill any hidden slugs in the outer leaves. Napa Cabbage, or Chinese Cabbage is a fast crop. 'Minuet' (F1) is a smaller growing variety which matures in only 48 days when sown in late August. These heads will make many sweet, crispy salads. 'Livigna', a green Lolo Lettuce is often pricey in high-end markets. Known as a European mini head or a garnish lettuce, many prefer it's crispy, green curled leaves better than any other lettuce variety. Pansy seedlings can be seen on the left. 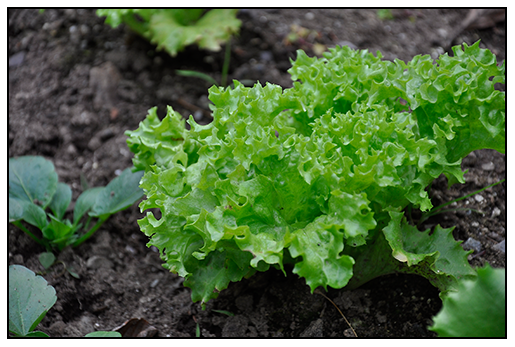 Lettuce is another plant that often grows better in the autumn. I like the fancier European mini heads of lettuce such as the Lolla series. We can often harvest lettuce right up to Christmas, especially if we cover it with remay fabric. The longer nights and cold weather makes the lettuce grow denser, less lush yet more in-character to well-grown fancy lettuce found in gourmet markets and restaurants. Sometimes seed can be costly for these fancy varieties ( $8 per packet) but when a head costs $6.00 at Whole Foods, one doesn't seem to mind so much! 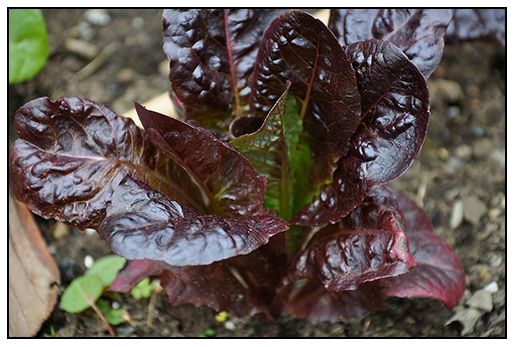 'Red Cash' is a new variety of Red Romaine bred for the commercial restaurant trade. This organic seed-raised variety forms beautifully dense, tiny heads for the specialty market, or, for ones home kitchen. 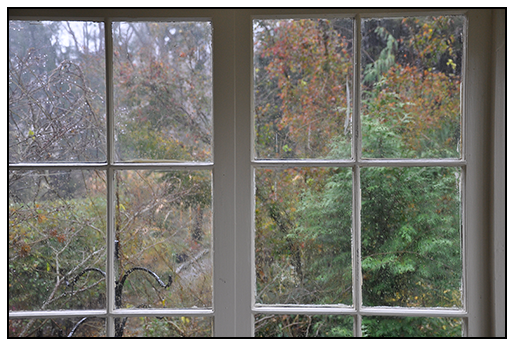 Hurricane Sandy is blasting at the coast here in Massachusetts, but so far, we are only getting wind gusts to 65 MPH. We still have electricity, but I am not confident that we will have it for long. I'll probably think otherwise once our power goes out, but so far, Hurricane Sandy isn't living up to the hype. Sure, like most people in the eastern part of the US today, we are hunkered down, watching the weather channel, and trying to get some remote work done on the computer before we lose power, but as far a storms go, this might as well be a mid-winter nor-easter. Which reminds me - have you heard that this year the winter storms are going to be named? 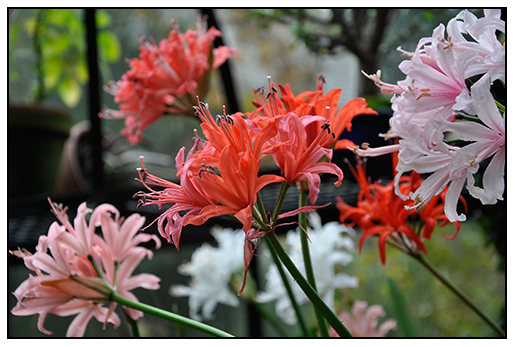 Autumn in the greenhouse - as the hurricane roars outside the glass, the Nerine sarniensis bloom feeling rather safe, even though a tree could fall on the greenhouse with the strong winds coming from the east. I feel that the storm is about a strong as a typical nor-easter in the winter, but seeing that we have few leaves left on the trees, we might be OK.
Green Chrysanthemums (Kermit) and some Japanese mini bonsai-style mums bloom along with the Nerine bulbs as the hurricane blows outside. Maybe we are getting used to these late October fierce storms, as we seem to have taken fewer precautions with this one. At least it isn't snow. Still, with a glass greenhouse which sits next to tall spruce trees, it's a little disconcerting. Sad news - we lost the two small males last night, but clearly they had problems anyway. We felt now that we did all that we could. The one small female is finally feeding by herself, which means not only is she getting the nutrition that she needs, it also means that we now can get some sleep! ISN'T IS FUNNY HOW KIDS ARRIVE AT THE MOST INCONVENIENT OF TIMES - LIKE DURING A HURRICANE. HERE IS LYDIA AT 4:30 AM TODAY WITH HER NEW LITTER OF PUPPIES. SHE'S BEING A GREAT MOM. AND FOR NOW, EVERY THING HERE IS ABOUT WHELPING. SO, SO TINY, AND SO WEAK. 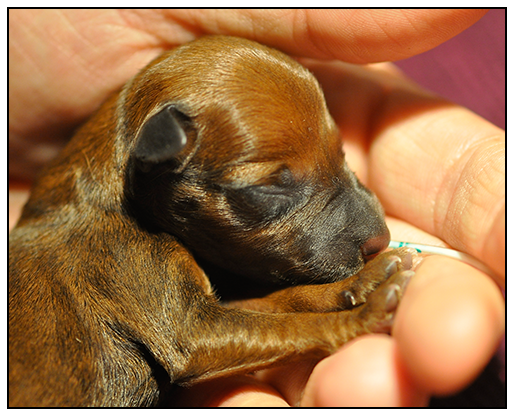 THIS YOUNG MALE IRISH TERRIER WAS BORN SMALLER THAN HIS LITTERMATES. 24 HOUR CARE IS REQUIRED FOR A FEW DAYS. I'll make this quick, not because we are waiting for the 'Superstorm' to arrive...( is it me? Or is the media making a bigger thing of this than any other storm in history?, or because I can't wait to get more pictures of Lydia's new litter of puppies, but because I am just plain tired....Lydia went into labor at 9:30 Saturday night, and her first puppy arrived at 3:00 AM. The rest followed, with the last arriving as a still-born at 6:30 am. 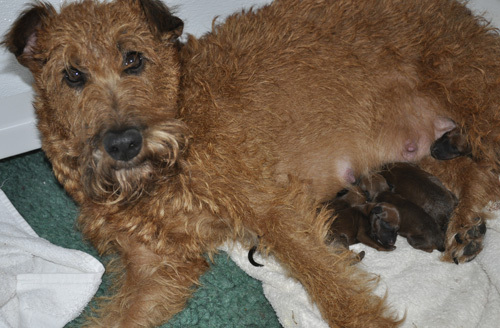 She gave birth the 5 live pups, but two are barely hanging on. 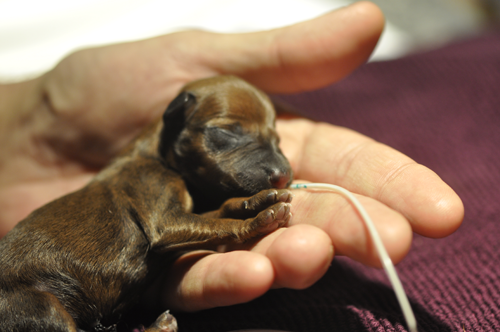 We rushed her to the medical center at 8:00 am, and although she is fine, the two puppies have a slim chance. Still, we are trying the only thing we can at this point - some hand feeding, since they are not suckling. ONE OF THE BOYS, THE FIRST BORN IS SO SMALL, THAT HE IS TWICE AS SMALL AS HIS BROTHERS. WE ARE ADMINISTERING PLASMA TWICE A DAY, AND LIQUID DIET EVERY TWO HOURS AROUND THE CLOCK TO TRY AND BRING HIS HEALTH BACK TO NORMAL, AS WELL AS HIS SIZE. WE'VE DONE THIS BEFORE, BUT IT DOESN'T ALWAYS WORK OUT. FINGERS ARE CROSSED FOR THIS LITTLE FELLA. This part of the venture has been interesting since our vet hospital has us trying some canine frozen plasma (FFP)- which is rather state of the art, which is like magic food for young puppies only good when used in the first 36 hours after birth. 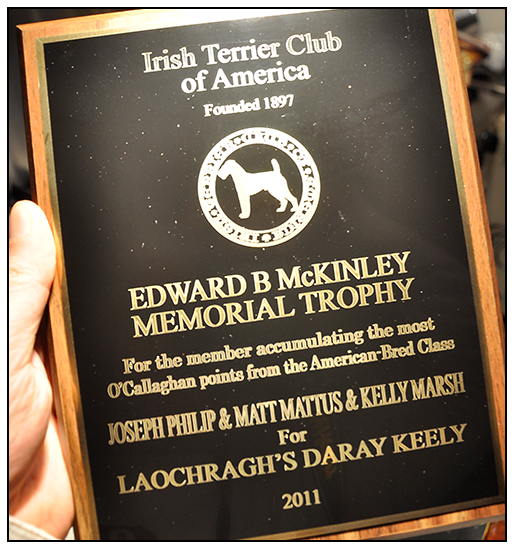 It comes from W. Jean Dodds, DVM HEMOPET in Garden Grove, CA, and is is provided to the patient orally. One important use of blood plasma is to provide a source of globulins ( plasma protein antibodies) to protect weak, fading or orphan newborns against the common infectious agents to which they are exposed. Joe and I are taking turns feeding them with a stomach tube which we've done before, but it requires us to feed them every two hours around the clock. It's fine, but this first day is difficult since we've already been up more than 24 hours. So far, so good. The rest of the new family is fine and healthy, Lydia has been an amazing mom so far, eating and drinking like crazy, and caring for her infants. Now...for what we've all been waiting for ......the winner of the Gas Powered Leaf Blower provided by the great folks as Troy-Bilt, is AMITY BEANE! I will try to contact you directly for shipment info, but if you read this, please feel free to email me your shipping information. Congratulations! 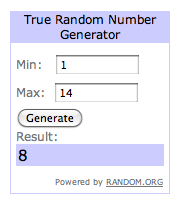 And thank you all for entering! WILL THIS AWESOME GAS-POWERED LEAF BLOWER FOR FREE! 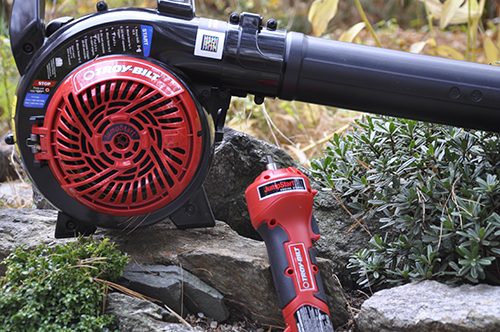 Thanks to the good folks at Troy-Bilt, you can win a free Troy-Bilt Gas Powered Leaf Blower plus a free automatic JumpStart™ Engine Starter, which features a rechargable 12 volt lithium battery, which will eliminate the pull start often required with gas-powered gardening tools. We have one of these ourselves, and if you have never used a gas powered leaf blower, you don't know what you are missing. 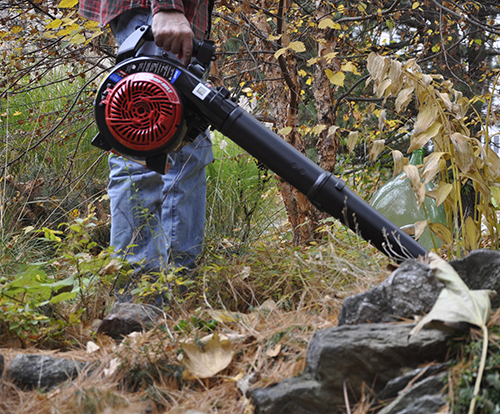 They are much more powerful than rechargable cordless ones, making the task of blowing leaves incredibly easier. We never considered even getting a leaf blower until our tree-workers pulled one out of the truck one day to clean-up after cutting down a couple of our tall trees. All you have to do is three things ( if you haven't done it already). First, leave a comment on this post, as this is how randomizer will select the winner at 9:00 PM on this coming Sunday night. Second, join Growing with plants' Facebook Page, and third, follow this blog by "joining it as a follower" on the grid box with the little pictures in it on the right hand side of this page. These all may seem like silly rules, but each one helps me tremendously, in building SEO ( Search Engine Optimization) as well as improving my blog status in ratings. After all, it's all a numbers game! As as I am currently the number 14 ranking gardening blog worldwide, wouldn't it be great to be rated in the top ten! If you are selected as the winner, Troy-Bilt will send a brand new Leaf Blower and Automatic Starter (nearly a $200 value!) directly to you next week! 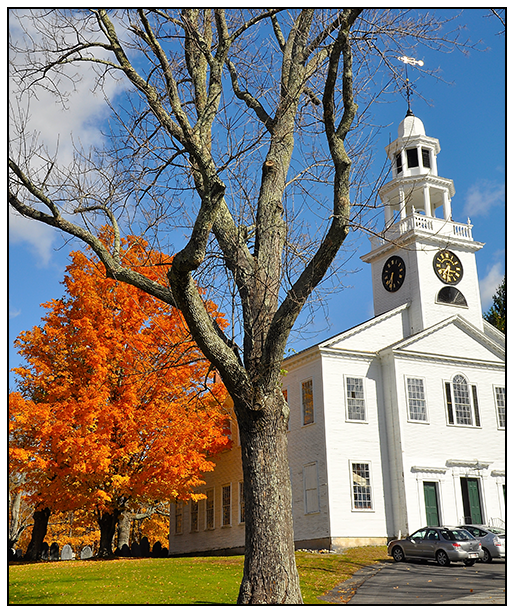 THE COMMON IN ASHBY, MASSACHUSETTS - THE ICONIC WHITE STEEPLED CHURCH AND A BLAZING SUGAR MAPLE. SURE, THE MOTIF ON THE LEFT WITH THE GRAVESTONES IS ALMOST TOO PERFECTLY SUITED FOR A HALLOWEEN DISPLAY, BUT IT'S REAL. Sometimes, New England can be a cliche. Snowmen, pine trees and sleighs at Christmastime, fields of cowslips and meadows with crocus, daffodils, bunnies and tulips in the springtime, Fourth of July parades, the Cape, red-white and blue bunting and blue hydrangeas in the summer, and then - autumn. Pumpkins, sugar maples and turkeys at Thanksgiving. We even have Pilgrims. Yes, living in New England is a bit like living in a Hallmark Card store ( if there still were Hallmark Card Stores), (...are there any? I'm not even sure anymore!). THE PUMPKINS AND GOURDS WERE PLANTED LATE, BUT THE VINES STILL SUPPLIED A COUPLE OF FRUITS FOR THE DOOR STEP. Isn't it funny? When you live somewhere beautiful - those destination places such as Hawaii, Aspen even New York City, it can be too easy to not appreciate the beauty of ones own backyard. 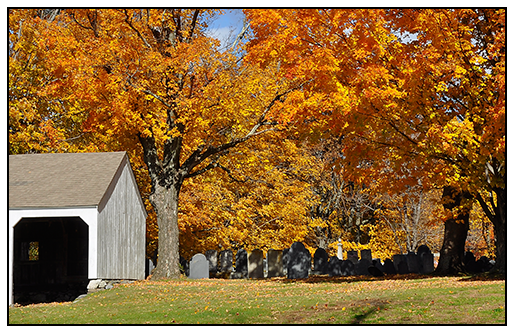 So today, I share a few images of ours - or, to be more exact, a 20 mile radius from our house in central Massachusetts. This past Sunday happened to be a glorious autumn day, iconic and picturesque, I mean in a calendar-sort-of-way. Sometimes. it's just nice to tour around the block, or the neighborhood. Risking cliche, it can be surprising what one finds. ANOTHER VIEW OF THE CHURCH GRAVEYARD, SOME STONES DATE BACK TO THE 1600's. 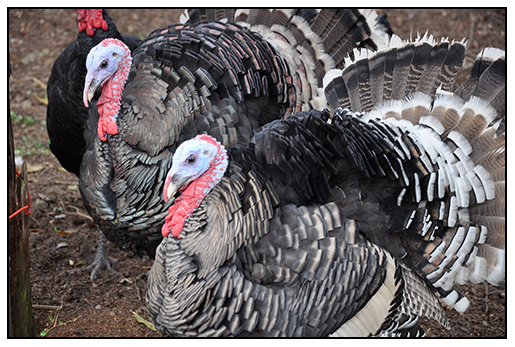 OUR HEIRLOOM TURKEYS, TYSON, ON THE LEFT, AND SARAH-LEE, ON THE RIGHT ( ONLY KIDDING - THEY ARE BOTH BOYS! ), ARE BEGINNING TO LOOK LIKE THANKSGIVING SALT AND PEPPER SHAKERS. 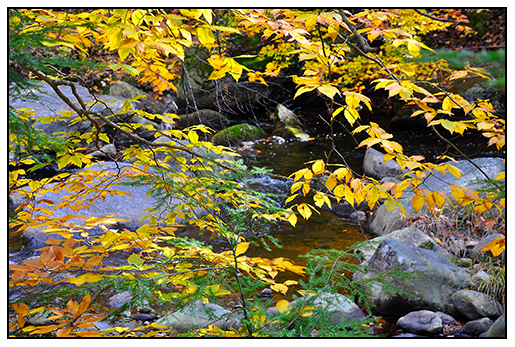 BEECH TREES ARE THE LAST TREES TO TURN COLOR, IN THE WOODLANDS AROUND WILLARD BROOK FARM. THIS WAS THE STREAM I GREW UP PLAYING IN. IT IS STILL FULL OF BROOK TROUT AND CRYSTAL CLEAR. I IMAGINE THAT THERE IS STILL CARDINAL FLOWER GROWING HERE. 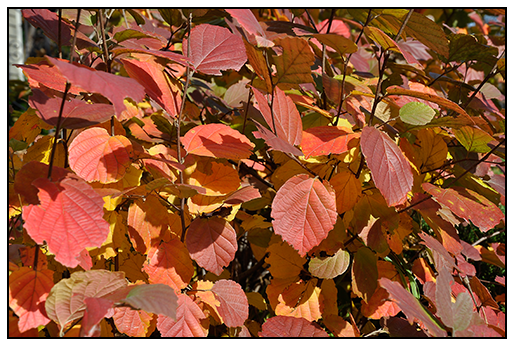 IN THE GARDEN, COLOR BLAZES WITHOUT AN EARLY SNOW SUCH AS LAST YEAR, WHICH RUINED MUCH OF OUR FALL FOLIAGE DISPLAY. HERE, Forthergilla gardenii PUTS ON A BRILLIANT SHOW. OUR BEAUTY BERRY IS BEAUTIFUL. 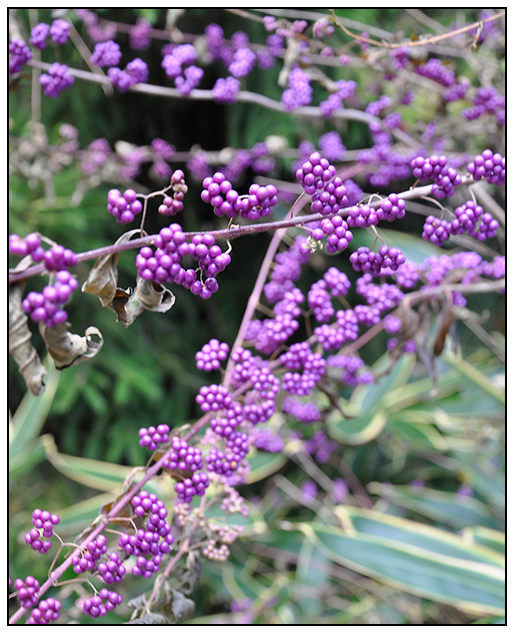 Callicarpa dichotoma IS TRULY VIOLET, IN ALMOST AN ARTIFICIAL WAY. THIS SPECIES FROM CHINA IS STILL RARELY ENCOUNTERED IN HOME GARDENS. THIS WAS A NICE SURPRISE TODAY. WE WERE UNAWARE THAT LYDIA, OUR IRISH TERRIER HAD WON THIS AWARD THIS PAST WEEKEND AT THE BANQUET OF THE IRISH TERRIER CLUB OF AMERICA. WE DIDN"T GO BECAUSE SHE IS ABOUT TO GIVE BIRTH TO A LITTER OF PUPPIES. SHE DOESN'T LOOK PREGNANT IN THIS PIC, BUT FROM THE OTHER SIDE, LIDDY BUG IS AS FAT AS A SOW. 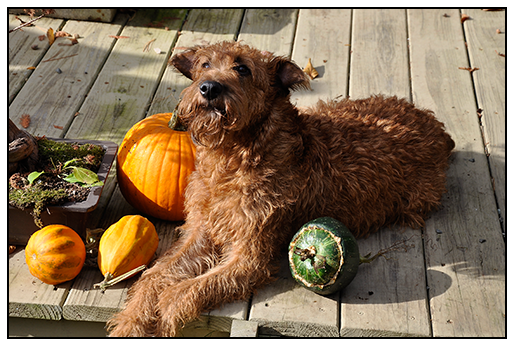 DUE THIS WEEKEND, WE ARE ANXIOUSLY AWAITING HER NEW LITTER OF HALLOWEEN PUPPIES. I THINK SHE CAN'T WAIT EITHER. MY EXHIBITION MUMS ARE BEGINNING TO BLOOM. IN ANOTHER MONTH, THEY WILL PEAK. Clockwise from top: Myss Goldie, John Lowry, Heather James, Indian Summer, and Fort Smith. We are just starting the season for Chrysanthemum shows, and although you may poo poo those dense, potted meaningless mums growing in fiber pots and bushel baskets at the farm stand or associate mums as funeral flowers or cheap, filler flowers best left for supermarket purchases, think again - the mum is making a comeback, and it's starting at your local botanical garden. 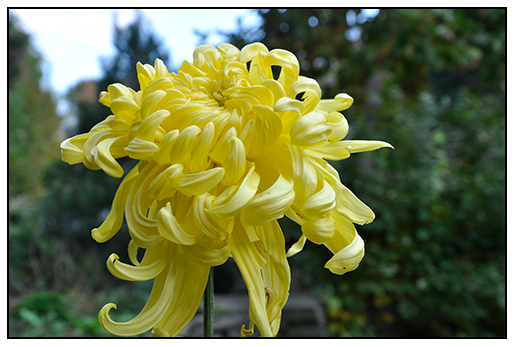 The chrysanthemum has a long, long, long - even ancient history with human culture - they have been cultivated and careful displayed with perfection for more than 2000 years. 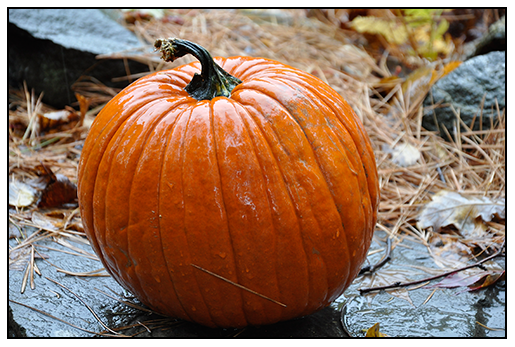 They are the lost art pieces, or objet d'art and have captivated humans, helping them celebrate the seasonal shift into autumn since, well, since before Christ. Even though I think the mum needs to be rediscovered by more people, I agree that they also need a makeover - a good agent and perhaps a major re branding. THE PALETTE OF AUTUMN IS SURPRISINGLY FLEXIBLE. AND EVEN THOUGH ONE MIGHT BELIEVE THAT BRONZE, PINK, FLESH TONES AND COPPER COULD NEVER WORK WELL TOGETHER, I SAY THAT THEY BLEND PERFECTLY. 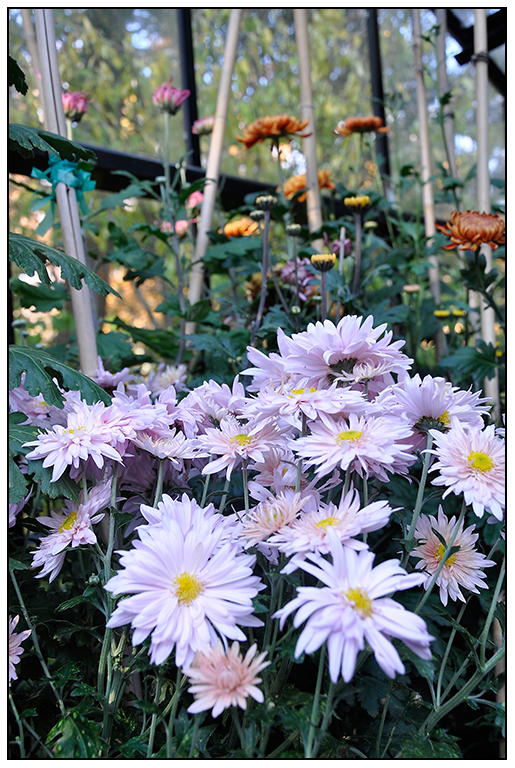 If you are looking into growing chrysanthemums, they are not that easy to find. These exhibition types must be grown from cuttings, and there are only a couple of sources on-line. I get mine from Kings Mums, but there are other places which will require some in depth Google searching to find. These are not the same mums as those found at potted plants, or at farm stands, for these are not completely hardy ( not that most farm stand mums are hardy either, even though they are sold as 'hardy mums'. 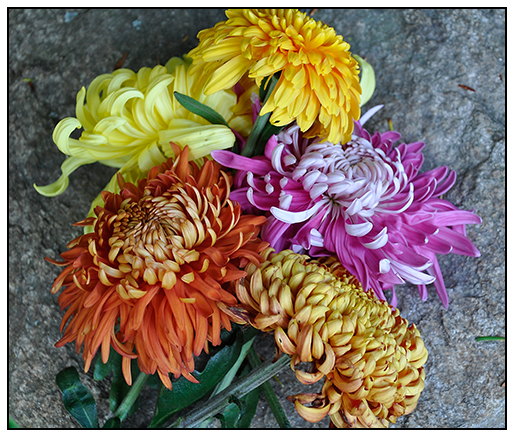 Here in New England, few mums are truly hardy through a hard winter. Exhibition mums are easy to grow, and even to winter over, they just need to be lifted in the late autumn, and protected a bit more - placed in a box in a cool shed, or cellar. These 'stools' are often stored under benches in a cool greenhouse in my case, and they send out new growth in the spring, which make good cutting material. That said, it is easier to by new rooted cuttings in the spring from on-line retailers since they only cost a couple of dollars per cutting. This is by far the best way to grow these sort of mums. 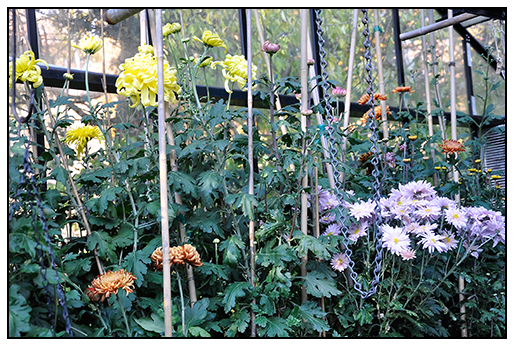 Humans have been cultivating the Chrysanthemum since 15th Century B.C. Hello? I said B.C. "Are you kidding me? Asian orchids and mums are some of the first ornamental plants grown by mankind. They are THAT old. Mums are our Yoda of modern horticulture. In China they reigned as one of if not the first plant man ever cultivated for royalty- heck, they didn't even make it to Japan until the 8th Century A.D. 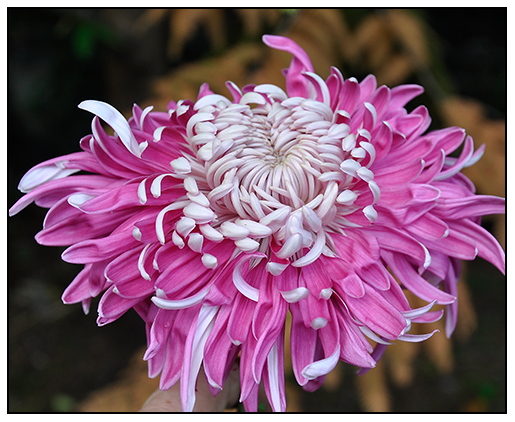 The Chrysanthemum predates modern religion , heck, it predates ancient religion! These are living relics, Now treated more like special art installations than seasonal plants with provenance. They have become the Chihuly of flower display that botanic gardens use to draw in viewers, along with model trains, fairie gardens, griftshops full of silk sunflowers and amaryllis bulbs, and home made soap. Crowds don't come for the mums - they come for the 'wow' factor. The amazing symmetry, the Asian theme which surrounds them ( the tea houses, the Japanese maple displays, the bonsai all add the the experience). I'm OK with that, for how else might we educate the viewing audience to appreciate these kings of the mum world. After all, who else could ever grow them? The days of huge private estates with housewives home directing the gardening staff to manage the floral displays properly are gone. Gone the seasonal cycles on large, private estates - you know, like those seen in feature films such as Sabrina, Downton Abby, and the Vanderbilt's. Mum's grown properly require daily care from spring until autumn, and then the must be set into displays. These are display crops from another era, and unless you are Martha Stewart sipping organic greens and carrot juice on you private farm/estate in Bedford, NY, who else could grow them privately, or who else would honestly even care to? 'FORT SMITH', A LARGE GOLDEN YELLO SHOW FLOWER JUST BEGINNING TO OPEN IN THE GREENHOUSE. With mums, it's really about respect. Toss a bunch in a funeral display, and they seem dull. Tie a bunch together in a celophane tie, and they look even cheaper. But carefully disbud and raise a single blossom, and then set it on a stage, and it becomes something else. It's all about respect, and no one know respect better than the Japanese. Gesture, pose, positioning, color - isolation and control transforms an ordinary object into art. CHECK OUT THIS AMAZING VIDEO PRODUCED BY LONGWOOD GARDENS, DOCUMENTING HOW THEY CREATED A TRAINED CHRYSANTHEMUM FOR LAST YEARS CHRYSANTHEMUM SHOW. IT IS INCREDIBLE. 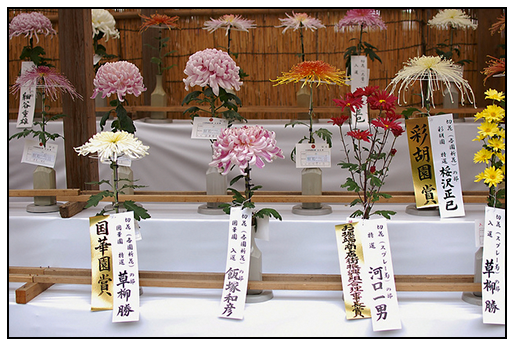 In Taiwan, China, Japan and Korea, Chrysanthemum Exhibitions are still very popular, but these cultures have a deep connection with the plant, something Americans and Europeans never will have. To start with - dismiss any thoughts about those tight, dense mounds drenched in growth retardants and chemicals to form mounds which look more like sheered sheep than the towering 6 foot specimens treasures for centuries. 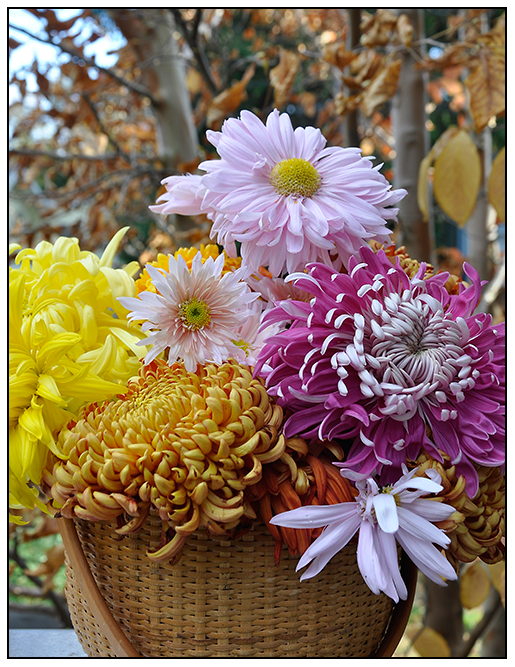 Mums are easy to grow, fun to train and come into flower within one growing season, so there should be no reason why we could not grow these icons of autumn. Except one thing - you would need a massive estate range of glass houses, and a staff from Japan or China who could tend to their exacting needs every that during the summer. I almost forgot about that part. Which is why today, a sight such as that going on right now at the Phipps in Pittsburgh, the New York Botanic Garden or at Longwood Gardens , or next month at the Smith College, the Isabella Stewart Gardener Museum in Boston is so important - they are very special events. And who knows how long these will ever continue. 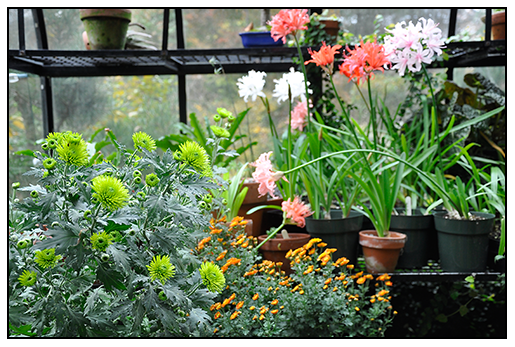 ALONG THE BACK BENCH OF MY GREENHOUSE, THE SHOW MUMS ARE TALLER THAN I AM, WITH MANY BUDS STARTING TO OPEN. One never regrets planting bulbs, but one typically regrets not planting them once spring arrives. It's not too late to prepare your garden for spectacular displays of bulbs, as most bulb catalogs are starting their sale period, and although many good varieties might be sold out, values abound. Plus, don't forget that you can plant bulbs right up until the ground freezes - I have planted bulbs as late as early December in some years - not optimal, but sometimes one can't resist a close out sale! And in the spring, no one knows any better. We plant hundreds of bulbs, and each year, I order and order varieties, never really thinking about how I am going to plant them all. When the arrive, they often sit on the back porch, where it is cold ( as many bulbs will abort internal flower buds if kept at room temperature too late, which is why one must be careful buying bulbs from a super market), and these boxes and bags of bulbs pile up waiting for a free moment ( as if I have any) to plant them. This year I ordered many bulbs from Colorblends, and as a first time customer, I was very impressed. As usual, I was late in placing my order, and many of the bulbs I really wanted were sold out - like the parrot tulips, but I found a few blended tulip mixtures that I liked, and few hundred muscari, scilla and crocus ( don't ask). I placed my order this past Tuesday night after returning from Pittsburgh, and since I knew that I was going to be in San Fransisco for 6 days, I wanted to take that free night to catch up of ordering bulbs. I was hoping to plant today, Sunday as my flight was to come in at midnight last night, but the bulbs arrived Thursday, a day and a half after I ordered them. Joy. I OFFERED TO REVIEW THIS DEVICE CALLED A PRO-PLUGGER. I WILL GLADLY TEST SOMETHING IF IT IS SOMETHING THAT I WILL USE, AND IF IT SEEMS TO BE AN IMPROVEMENT TO SOMETHING ALREADY ON THE MARKET, AND THIS SEEMED TO FIT THE BILL. 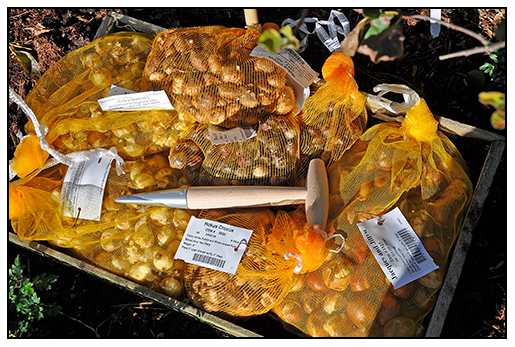 No matter how many bulbs I order, sometime thousands - all seem to get planted over time, but I am rather old school with my methods, relying on a trowel, shovel or pitch fork to clear away soil, and to jab into the ground, often un-elegantly sliding a few narcissus or tulips under a spade as I lift it, and I call it a day. Bulbs are forgiving creatures, self-adjusting themselves at the proper height after a season of growing, and all they ask of us is to be planted early, and left alone. A gentleman who owns and invented a device which he called PRO PLUGGER, contacted me a while back as asked if I might want to try a PRO PLUGGER. You can check out the website here, it seems to be marketed for those who want to make plugs - lawn plugs in particular, something I will need to do for our front lawn which is impossible to seed, but that will need to wait until spring. Once the box arrived, I opened it and thought - this will be excellent for planting bulbs. And, in the end, it was more than wonderful - it was a time saver, a back saver and a relationship saver since I could now take Joe and the dogs for a long-promised ride to the orchard. 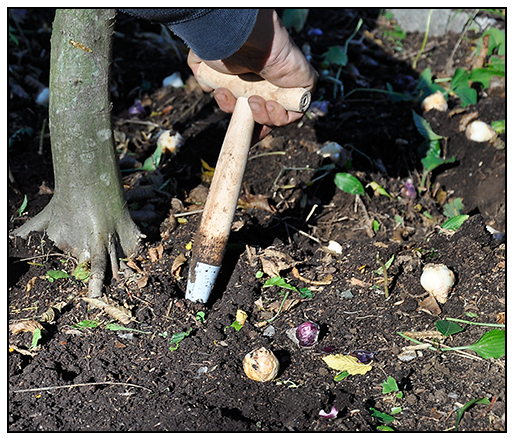 You can see a great video about how they plant bulbs with the Pro Plugger here. The Pro Plugger took a little getting used to ( I didn't know how to get the soil out of it, but quickly figured out that it had to be turned upside down each time, as the tip is tapered. 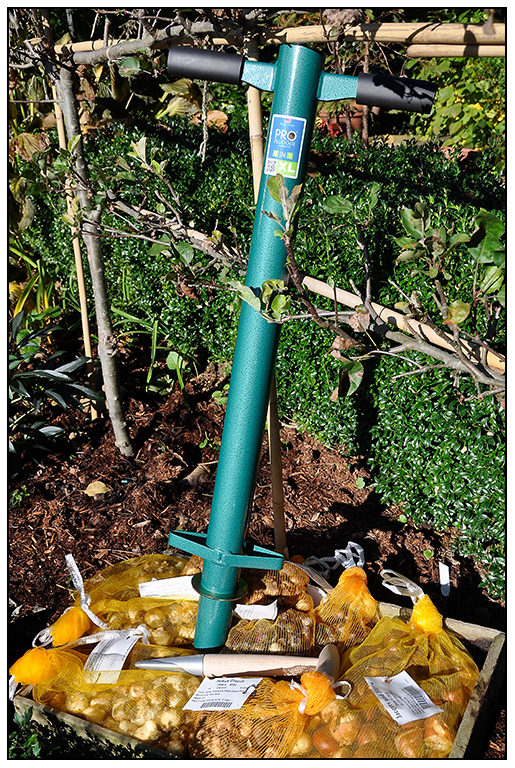 The PRO PLUGGER made planting bulbs fast and easy. The best part was that I could lay out a grid of bulbs quickly, such as this border of 200 Darwin tulips which I am planting in a mix of orange and pink. Tulips look best en masse, planted in tidy rows along boxwood hedges such as here, below an espaliered apple hedge in front of the greenhouse. 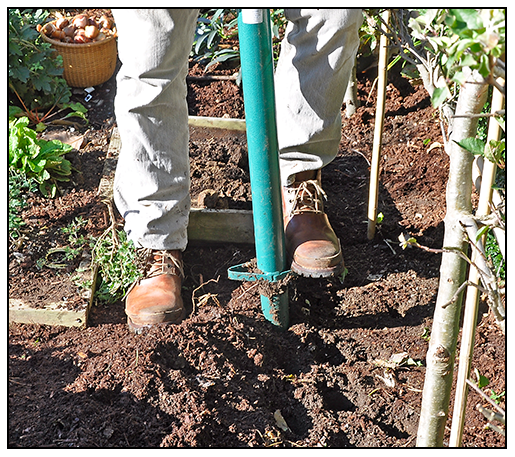 The PRO PLUGGER was not easy at first- but I quickly realized that I needed to pull away the composted mulch layer to expose the soil below. Once I did this, the task was easy, and I have a grid of 300 holes punched into the ground in 15 minutes. 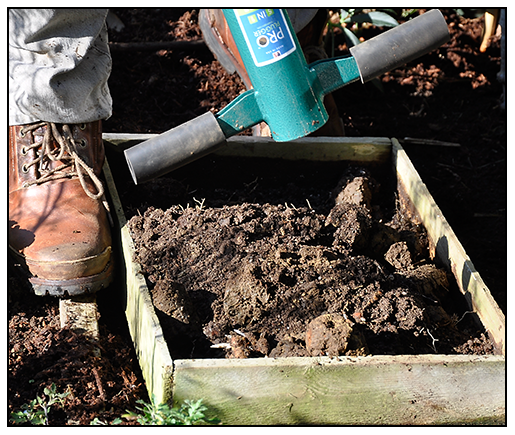 Excess soil as plug, are deposited into a greenhouse flat. This soil I used later to fill in the holes over the tulips. 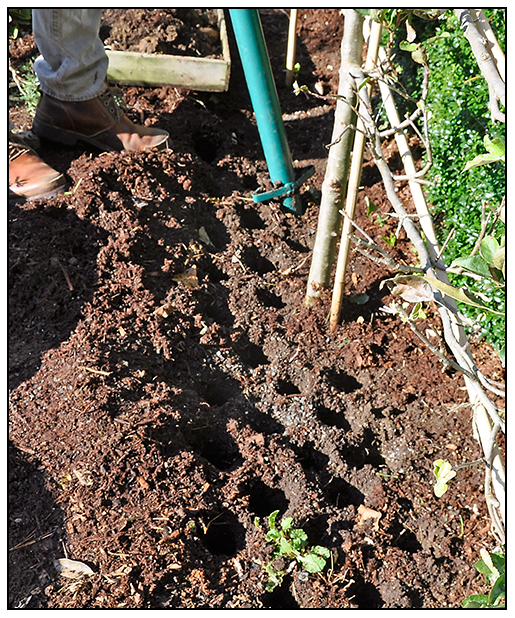 Once a grid of holes is completely prepared, I can start the easier part of dropping in the tulip bulbs. Smaller bulbs such as Muscari require only a classic dibble stick. My plan here? 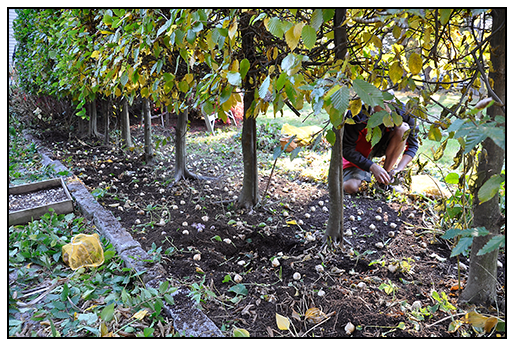 To plant a carpet of blue lesser bulbs naturalized under the pleached hornbeam hedge, which is bare in the spring. The second place where we are planting bulbs in volume is along the long walk leading out back to the chickens. I had been training a pleached hedge of hornbeams along one side of the walk for about 12 years now, and underneath the hedge, which is deciduous, the soil has been bare. I always imagined drifts of golden narcissus or other bulbs here for a long time, but I opted for a sea of Primula elatior - the Cowslip primrose, which we have been growing here for a few years. The primula are starting to decline, so it was time for something new. I decided to plant 300 hundred muscari, or Grape Hyacinths, mixed with other small, lesser flowering blue bulbs. So 300 Chinodoxa and 300 Scilla siberica have been added. To achieve the proper effect, all of these tiny bulbs need to be planted at the same time, otherwise, one will not be able to see where one species is planted, when planting the second species, and bulbs can get damaged. Also, when layed out on the surface of the ground, it is easy to adjust the layout a bit, ensuring proper spacing and distribution. It seems like a big task, but this only took an hour or so. The dibble stick has a metal tip, which makes piercing a hold near stones or at the base of this hornbeam, easier. 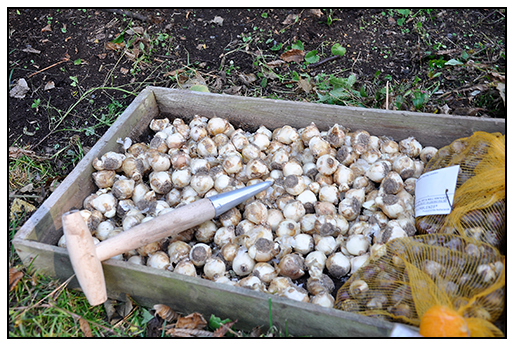 Bulbs are mixed ahead of time in a large flat, and then spread on the ground in a random pattern. Not truly naturalized, this is often the method most gardeners refer to when speaking about naturalizing. 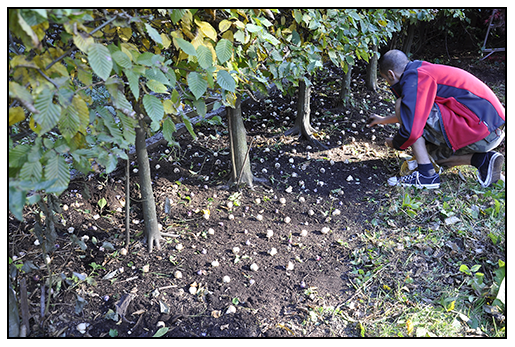 Bulbs are tossed onto the prepared ground, and then planted wherever they fall, which creates a more natural pattern. It was a busy Sunday, with nearly 1200 bulbs planted in one day, but we will forget about the blisters and soiled knees once spring arrives. 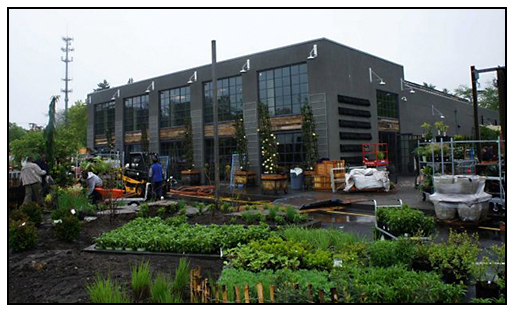 PACIFIC HORTICULTURE RE BRANDS ITSELF. Left, boring. Right, Awesome! It makes me want to go renew now! Will design save the day? Maybe. Left: the old, right: the new and improved magazine shows how a design firm and savvy understanding of who their consumer is can save an organization from becoming extinct). In case you haven't noticed because you've been busy planting bulbs, we are in the midst of monumental a monumental shift in how we consume information. Newspapers, magazines, books, music and television are becoming obsolete as we adjust to a new model which offers content 24/7. In case you've been under a rock, television programing is desperately trying to attract our attention, but just try to find something worth watching. Wouldn't you rather press the pay-per-view button on a Saturday night and select a show like WILD ALPINE FLOWERS OF TIBET or TERRARIUM WORKSHOP 101? I predict that this will be the future - until then, we must tolerate reality TV and Honey Boo Boo. As a design professional, I am acutely aware of how business and in particular, entertainment had to work harder to capture the attention of end users. Even the design of this blog shifts as I constantly experiment with what I feel my consumer might like based on where cultural trends are shifting. Even though I know how essential visual branding is, even more important is the content. 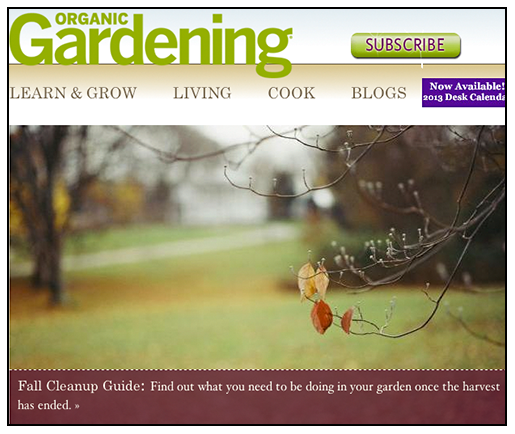 Many blogs repeat the same content, or they find a niche like"Angry 'Organic' Gardeners" or "Backyard Garden Biographies". These are all fine, but as more and more gardening blogs come on to the scene, competition will distill them down to only the finest - meaning, those which offer the most effective content and essentially, the best visual experience in photos and factual writing. This is all health, as blogs are filling the gap in a world where well-designed gardening magazines with relevant content with some depth, are disappearing. My niche with this blog crosses over into the territory of plant society journals by offering both practical gardening content that you cannot get from other blogs, plus, in-depth explorations for those who may be curious about more specific journeys with plants. Few commercial magazines could ever justify the value or ROI of an article about Flowering Aloes on a windowsill, for example. Or rare bulbs from Peru. 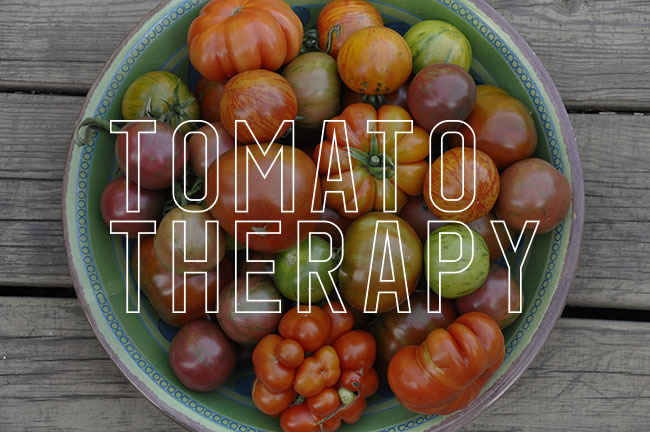 Marketing would much rather have them focus on main-stream subjects like "how to plant a container of heirloom tomatoes". The only problem with that is, once you know how to plant such a container, you want to know more. 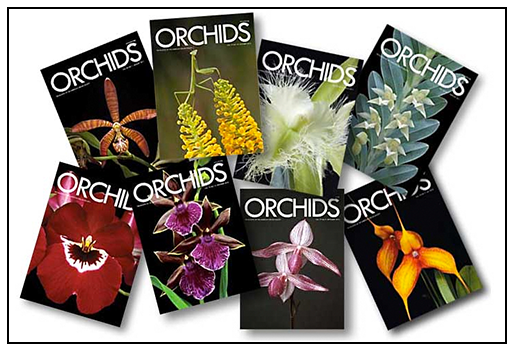 THE AMERICAN ORCHID SOCIETY REALIZED THAT THEIR JOURNAL, THE AOS BULLETIN. PUBLISHED SINCE 1932 WAS NOT ONLY DATED, BUT VISUALLY OUT-OF-TOUCH WITH ITS READER. THE SOLUTION? DESIGN AND MORE STYLISH AND FOUR-COLOR JOURNAL. Specialist plant societies are particularly struggling, with concerns ranging from "how can we attract young people?" to "I wish we could have better printed journals". In much the same way they often gripe about the loss of Ektachrome and Newspapers, many older members gripe about how young people are 'texting all the time". They are not curmodgeons, they simple cannot wrap their head around why technology is so natural a resource for young people. The truth is that younger people who are interesting in flowers or plants are engaged - just differently -for they would rather visit a blog and ping a photo to their Pinterest account of a boxwood hedge or a DIY article about how to make a succulent wreath than attend a plant society meeting and sit through a slide show. 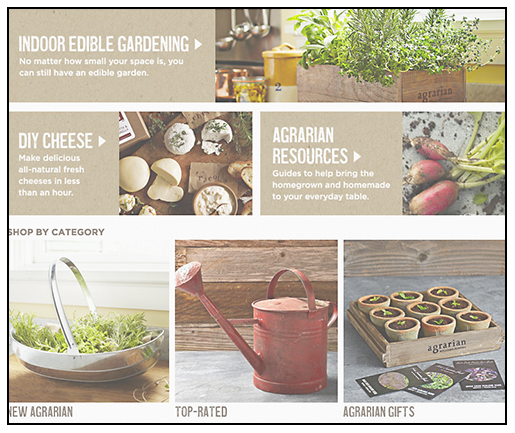 RODALE'S ORGANIC GARDENING BRAND UNDERTOOK A MAJOR MAKEOVER A FEW YEARS AGO, REFOCUSING ON DESIGN AND CONTENT - THIS IS A BRAND WHO KNOWS EXACTLY WHAT THEIR EVER-CHANGING CONSUMER WANTS. It's true, they are consuming these passions more superficially, only 'skin-deep' if you will, since their culture is one of sampling and quick-bites, but that may change once they get a taste of whatever they are sampling. We already can see the phenomenon shift as backyard poultry and cooking grow in popularity. Today's consumer is also more receptive to the experience - they enjoy good design, or good taste. They see many of these interests as a way to define themselves - not surprising in a world were the Gap and Old Navy offers the same jeans and graphic T's. Personal identity, fashion and perception is more important to this generation than any other before it. NEW DOESN'T ALWAYS MEAN BETTER. AMATEUR DESIGN IS AN UNFORTUNATE SIDE EFFECT WITH MANY PLANT SOCIETY JOURNALS AS DO-IT-YOURSELF DESKTOP PUBLISHING ALLOWS EDITORS TO TAKE CONTROL OF DESIGN THEMSELVES. CLEARLY, THE 1980'S ISSUE HAD A PROFESSIONAL DESIGNER INVOLVED. I have many thoughts about these trends, and although I have many ideas about what might happen in the near future, no one truly knows - but there are some givens. Firstly, there will always be people interested in something, and in a super-technical world, nature does become more precious and magnified - just look at Japan, and how a concrete world can foster a new interest in gardening, but I believe that what's shifting is the reason why people become involved in the first place. Up until now, people joined specialist groups because they wanted to seek a community - others who are like-minded. In the future, people may seek others who are more like them. Customizing their circle of friends. They may do this digitally first, and then in person later once they assemble their tribe. Networks may be tighter and more specialized because they can be. 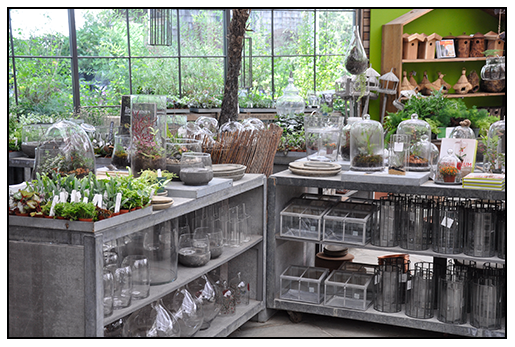 WILLIAM'S SONOMA'S AGARARIAN BRAND IS NOT ONLY PERFECTLY CRAFTED, IT TARGETS NOT THE SERIOUS GARDENER, BUT RATHER THE FANTASY OF APPEARING SERIOUS. TARGETING THE MORE AFFLUENT GARDENING CONSUMER, THE VERY FACT THAT THEY ARE CONSIDERING ENTERING THIS CATEGORY PROVES THAT A RENEWED INTEREST IN GARDENING IS A GROWING TREND. We are already seeing this in the plant world. A Galanthus (Snowdrop) collector may join any one of the global bulb enthusiast groups, but now given the opportunity to connect with the 24 or so real-passionate, geeky Galanthus collectors in a Yahoo Group, the experience is enhanced. We should not forget that the Internet was invented by scientists to connect for this very reason. As social networking changed how we communicate, younger people connect on-line first. Now, many of you over 50 are probably saying "Well, that's what's wrong with young people - they don't know how to socialize anymore." But I disagree. It may be true that many young people spend more time than they should "connecting on line making meaningless connections on their Facebook page", but for those who connect for a reason, let's say - those horticulture majors in college, or young people who have an interest in a particular plant genus - the Internet offers a tremendous opportunity to connect with like-minded people - an not just from their local neighborhood, but now they can connect globally. This global connection means that not only are people connecting on a broader scale, they also are connecting at a micro level - if one has a passion for a certain species or just variegated plants, they can connect with those few globally who share the same passion. Sure, there may be fewer people worldwide who are developing an interest or hobby, but that too may change and we all adopt technology into our daily lives. Native users undoubtedly will find no barrier between connecting with like-minded people world wide vs. native plant clubs who meet in person. 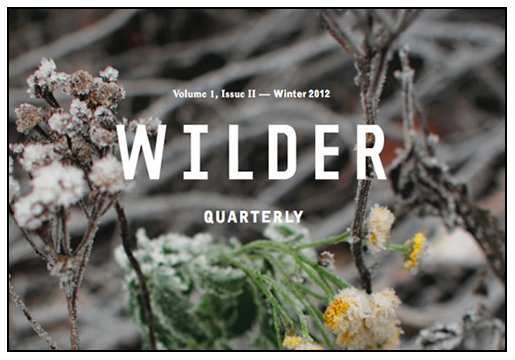 CLEARLY TARGETING YOUNG HIPSTERS AND LIFESTYLE FANS, WILDER QUARTERLY CONTINUES TO SURVIVE IN YEAR 2 DESPITE NAYSAYERS. If one thing changes how we socialize, I predict that this single fact will affect the future of all plant societies and plant clubs. The 'idea' of a 'club' or a 'society' may be a dated concept. The future may mean that many of us connect first on-line, and then later, attend live ( with real live human beings) events which may be local, regional or international conferences or social events, where sharing and socializing happens. If we had to start over again ( which is a creative exercise I like to do), how would we design a social community for those of us who are passionate about plants? It may mean a major horticultural institution like Kew, or even the National Geographic Society could host events that not only connects real people with like-minds, but also events that offer real interesting content - of the highest quality, not just personal slide shows. 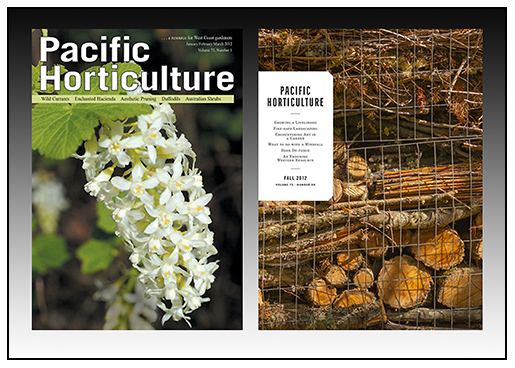 CURTIS'S BOTANIC MAGAZINE CONTINUES TO TO USE ITS CLASSIC DESIGN WITH SUCCESS, REMAINING HONEST TO ITS INTELLECTUAL PROPERTY AND BRAND. THEY TOO, KNOW THEIR CONSUMER. KEW MAGAZINE, WHICH AT ONE TIME USED THE SAME DESIGN, SHIFTED TO AN EQUALLY APPEALING YET UPSCALE DESIGN WHICH REMAINS SERIOUS, AND WELL DESIGNED. At the Eastern Study Weekend for the North American Rock Garden Society last weekend, this very subject came up. What will the future of a plant society look like? I struggle with this very question, but if I had to be honest, I believe that it will change significantly. As the world changes around us - and as I mentioned earlier, specifically media and how we consume it, a significant connection is being made in my head. Younger potential members of any plant society or club will ultimately ask " Sure, I could join, but what will I get out of it? What does a membership actually offer me?". With the cost of most memberships costing $20-$35.00, this is a valid question to ponder -especially since mostly, what one gets with a membership is a poorly edited and designed quarterly magazine ( journal) and perhaps access to a seed sale, and the opportunity to attend meetings, which undoubtedly are either wrought with arguing about how to improve the journal, or how to attract young people and new members. It doesn't take a genius to see what the problem is - most plant societies are becoming dinosaurs, with a majority of the membership using the computer as, well, a computer, with a younger base of potential members either being too busy with life, family and their jobs, or financially unable to even afford a house where a garden might encourage them to become more involved. Lack of free time also factors in at most levels for those under 65, and for those over - retirement still offers not only free time, but pensions, a long-history of arriving home from work at 5:00PM with time to work in the garden, and most likely, a childhood where they had free-reign to wander the woods un-supervised, discovering nature and hence, plants, birds and eventually, a passion for collecting plants. TERRAIN AT STYERS LOCATED OUTSIDE OF PHILLY IN PA CATERS TO THEIR YOUNG HIP AND AFFLUENT AUDIENCE WHO ENJOY EXPLORING THE WORLD OF TERRARIUMS AND FAIRIE GARDENS - PINT SIZED GARDENING THAT COMBINES STYLE, DIY CRAFT AND INTERESTING PLANTS WHICH THEIR PARENT'S MAY HAVE FOUND TO BE TOO OLD-SCHOOL. Today, any new "members" of any plant society are rare and few. Those with a deep interest - a real passion for a particular plant species are even more rare. But why? One reason may be that during this time of transition, people are just too distracted by the opportunities of technology. Many young people prefer video games rather than live television. They prefer to watch what few TV programs they watch not on a major network, but rather on a website like Hulu or Youtube. Any new media outlet will need to consider how users choose to consume content before any thought could ever be put to solutions on WHY one might want to join a club. Why? I already said it but you probably missed it - the reason is CHOICE. But as TV's and computers converge, on our monitors, our hand-held devices and even as our TV becomes more like a computer - consumers will have more choice. A whole lot of choice. Imagine - if you could choose to consumer what you want, when you want it, how great and liberating that would be. Young people are already editing naturally what they choose to consume, and what they don't. This week Newsweek decided to stop printing it's magazine - then of course there are magazines - Gourmet and Domino, and then TV with Martha Stewart going away ( but I predict that the MSLO brand already knows all of this, and very well may be the first to address this shift-head on given their asset library and intellectual property let alone their brand - if they do not have their own network in a year, I will have to go work for them and make it happen!). Younger people also are not comfortable with them term 'society' or even 'club' - it doesn't mean anything in a world where Facebook, Pinterest and Hulu live. These creative, curious and interested consumers have a deep desire to connect socially, but choose to do so through a digital connection. You know, blogs, etc. But I predict that the idea of a blog will evolve into something else soon, too. My point is that humans are, well.....human. Curious apes who will always have a desire and need to share projects, art and ideas. And in many ways, now that I think about it, today's youth are far more passionate about sharing DIY projects, craft, art, writing and images than any other generation before them. The future of plant societies, plant magazines, gardening TV shows and gardening clubs will change, but they won't go away - they will simply be redefined and re-imagined as something else, something that offers much, much more, something not invented yet. I think it's very exciting.